An actress and a human rights activist will teach people about overcoming hate crimes and intolerance in a series of events at Indiana State University Nov. 8-10. Chicago-based playwright and actress Rohina Malik and human rights activist Stephen Wessler will visit Indiana State and Terre Haute for a series of events to promote acceptance and respect for people from different religious and ethnic backgrounds. Malik will perform her one-woman play, "Unveiled," and join Wessler in several discussions about the production. Wessler also will speak about interfaith conflict resolution, bullying and hate crimes. "Rohina and Stephen will provide opportunities for ISU students, faculty and staff, along with community members to understand better what some of the challenges are for people who are oftentimes the target of hate crimes," said Arthur Feinsod, Indiana State professor of theater who helped organize the events. "That is the issue central to the performance of ‘Unveiled.'" 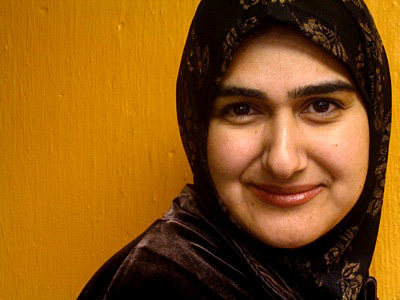 In the play, Malik portrays five Muslim women who were affected by hate crimes following the Sept. 11 terrorist attacks. She will perform "Unveiled" at 7:30 p.m. on Nov. 9 and 10 at ISU's New Theatre. Following each performance, Wessler and Tom Johnson, the associate director of the ISU Center for the Study of Health, Religion and Spirituality, will lead a discussion about the play and issues raised by the performance. "Stephen is a very passionate speaker who talks from experience," Feinsod said. "He uses examples from stories to help highlight these issues to make people aware of them." Wessler will also give additional presentations. On Nov. 8, he will present "Interfaith Conflict Resolution in Kosovo and Northern Ireland and its Implications for the United States" at the CANDLES Holocaust Museum in Terre Haute. His visit is part of an ongoing series hosted by the museum, Feinsod said. Making the presentation even more timely for Wessler, Feinsod added, is that the human rights activist will just be returning from working with people in Kosovo, which in the late 1990s was the site of ethnic cleansing. "He is engaging in conflict resolution between Christians and Muslims, and he will have been there for 10 days," Feinsod said. "I'm sure that experience is going to be very influential on his thought process and what he wants to discuss." Malik and Wessler also will team up to lead a discussion at noon on Nov. 10 in Cunningham Memorial Library at ISU about the traveling exhibition "A is for Arab: Stereotypes in Popular Culture." The exhibition, which will be set up in the Cunningham Memorial Library, features common stereotypes and caricatures of the ways that people of Arab, Muslim and Middle Eastern backgrounds are depicted in Western media, including the U.S. The exhibition raises awareness of these caricatures and stereotypes, explains their ramifications and presents ways to counter the narratives created by the dehumanizing imagery and stereotypes. "Unfortunately there are many misunderstandings due to stereotyping," Feinsod said. "We hope to educate our students about one of the world's great religions so they don't confuse realities with stereotypes and misunderstandings, which have been perpetuated in the media. From that understanding will come greater respect and appreciation. We are convinced of it." Wessler will also provide additional presentations. He will lead several presentations with the Vigo County School Corp. on adult bullying. On Nov. 9, he will also lead discussions about "Religious Belief and the University: Challenges in Mutual Respect" to honors students at Indiana State. "Bullying, hate crimes, and interfaith conflict resolution are three areas that he's covering while he's here," Feinsod said. "It gives a sense of the breadth of his focus as a human rights activist." Chicago-based playwright and actress Rohina Malik and human rights activist Stephen Wessler will visit Indiana State and Terre Haute for a series of events to promote acceptance and respect for people from different religious and ethnic backgrounds.